Girl Group formé en 1960 à New York et composé de Judy Craig (née le 6 Août1946), Patricia Bennett (née le 7 Avril 1947) et Barbara Lee (née le 6 Février 1944). Les Chiffons se sont séparées en 1972. 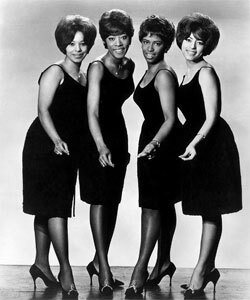 One of the best early-'60s New York girl groups, combining sassiness and innocence on several of the style's greatest classics. 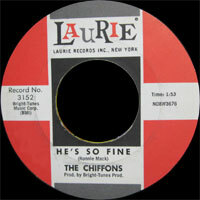 The Chiffons had some singles under their belt when they reached number one with "He's So Fine," whose classic "doo-lang, doo-lang" riff was appropriated by George Harrison in 1970 for his own chart-topper, "My Sweet Lord" (Harrison was subsequently ordered to pay substantial damages to the original publishers, though he always claimed the resemblance was unintentional). 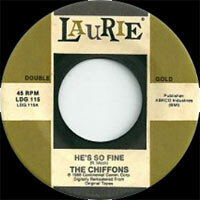 Their follow-up, Goffin-King's "One Fine Day," was just as good, featuring killer piano riffs from King herself. 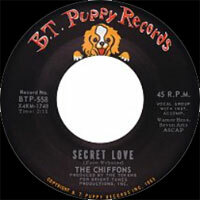 Actually cut as a Little Eva track, the Chiffons' Vocals was substituted, resulting in a Top Five hit. 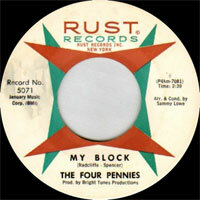 There were a couple other memorable hits -- "I Have a Boyfriend" and the Motown-influenced "Sweet Talkin' Guy" -- and interesting misfires like the Martha & the Vandellas-inspired "The Real Thing," as well as some singles issued under an alter ego, the Four Pennies. 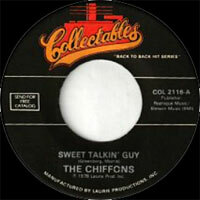 The group recorded quite a bit of material during the '60s, much of it derivative.